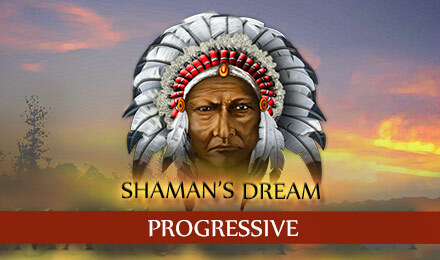 Enter the mystical world of Shaman’s Dream Jackpot Slots Game at Vegas Spins! Spin through 5 magical reels to uncover Secret Bonus Games and Progressive Jackpot riches! Adventure through the magical world of Shaman’s Dream Jackpot Slots Game at Vegas Spins! Fly through 5 Mystical Reels and 25 paylines to uncover the Wild White Wolf, the Dream Catcher Bonus, Secret Bonus Games, FREE Spins and Progressive Jackpot riches!